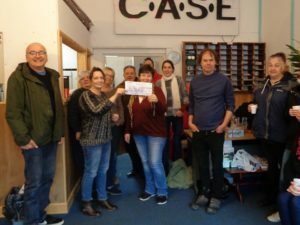 In February 2019 CASE Central has again been awarded a grant from from T.U.U.T. Charitable Trust, an organisation set up by the Trade Union Movement in 1969. This is the second year we have been supported by T.U.U.T..
On Thursday 7 February union official Lynne Gash-Quantrell from PCS and T.U.U.T. 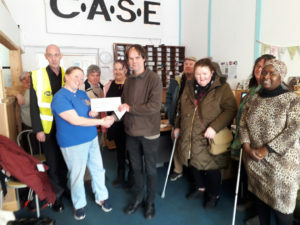 General Manager Marion Colverd visited CASE Central and handed over a cheque to our Fundraiser and Trustee Felton Shortall. They were accompanied by PCS representative Al. The ceremony was attended by some of our volunteers and Trustees, including senior Welfare Adviser Jess. We are sorry that our star advisers Sophie and Wendy were on leave! The grant from T.U.U.T. has been crucial for us to run our vital Welfare Right Advice service, as well as our free food service for the local community. But this award means much more than financial support for us. More important for our morale, this is a recognition that our work is also seen by trade unionists as a contribution towards a more progressive and just society: we very proud of this. Last year, on 23 January 2018, the T.U.U.T. cheque was handed over to us by union official Gerry Hyde from PCS. Gerry had known about our advice service and other activities in the community for years and could testify about our strength and professionalism. Many thanks to Gerry, Lynne and Marion for their warm support, and to Felton and Mark for having successfully appealed to T.U.U.T. !